I'm still stuck on 3 challenges, but that's o.k., any time I get to be creating I'm happy. I tried out the challenge at our creative corner , but I don't think I do vintage very well, but it was a try. Red, White, Hunter Green and the sketch I did pretty good. I just thought I had to have this Cuttlebug folder and I've tried using it a couple of times, but I'm still not feeling the love that I thought I would. I guess I'll put it away until next year. Supplies: White Card Blank 5" X 61/2" Halcraft, Cuttlebug embossing folder-Lace Tree, Wausau Metallic green card stock, red card stock from my stash, ribbon-Offray, Sharpie Poster Paint pen-gold, EK Success-sm. corner rounder punch, Martha Stewart border punch, Stampin Up-Sizzix Lg. Dots texture plate. Love it, thanks for sharing and playing at Easy Breezy... Welcome! Hi Beverly :) Your card is just gorgeous! 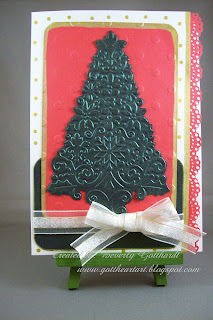 What an amazing design and I LOVE the embossed tree and vintage feel! Thanks for playing along with us over at Stamps and Smiles & Our Creative Corner! Oh your card is so beautiful! I just love the tree, is that embossed? Thanks for joining us at Stamps and Smiles and the OCC this week! Wonderful card, I just love that tree! Thank you for playing along with The Fresh Batch this week. Hope you join us again. Top 3, Beverly (#10), Arielle for its simplicity and our Winner... TADA, Steph (November 1 entry)!!! Your card and all details were awesome. Please email me to kewlstamps-n-more@sympatico.ca with TOP 3 or Winner EBKCC#9 in the subject line and I will do a reply attaching your PDF files (aka, the prizes) Again, thanks for playing and remember to grab your badge if you haven't already done so!